Cate is pretty good about playing in her crib if I need to squeeze in a quick shower. Now that she’s usually only taking one nap, getting a shower can be a bit more challenging. 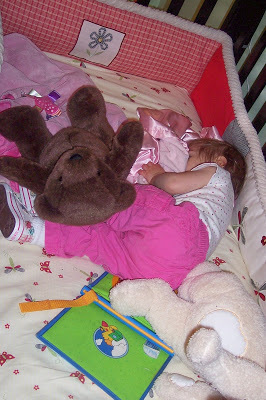 Today I put her in there with two stuffed animals, a book and music playing on the toy attached to the end of her crib. She was playing away, so I decided to take advantage of the moment, sort the laundry and start a load. When I came back upstairs, I heard her sleeping breathing. Sure enough … she’d given up playing for a little nap. I guess she decided she’s not quite ready to part with the morning nap, which is fine by me! How cute! Take a pic of her shoes i want to see them! I love her bedding, I want to see pictures of her room!